The newly proposed STEM building sees a hefty pricetag of €50m. Those who have visited DCU within the last two years may be familiar with having their route blocked off by numerous construction vehicles or nearly bumping into a wall of wet paint. 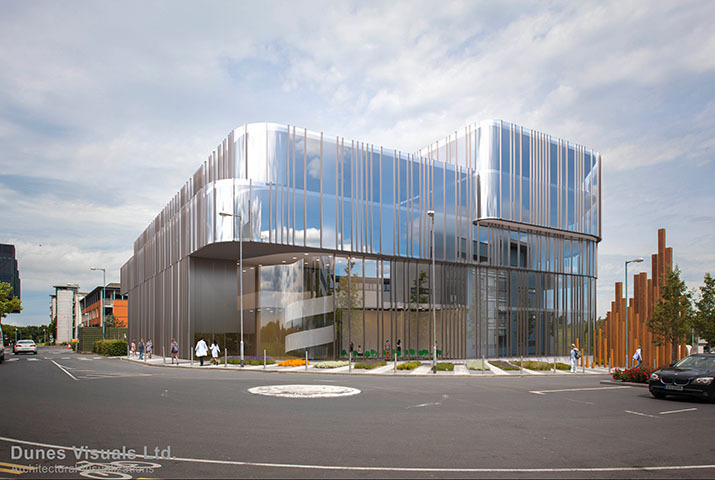 There is a universal sigh of relief as DCU’s highly anticipated, new state of the art student centre is due to open just in time for the upcoming semester. However, another deep breath may need to be taken because we’re not out of the construction woods yet. DCU recently welcomed plans for a new €50 million science, technology, engineering and mathematics (STEM) facility which will see our already shooting population grow by a further 3,000 students.These changes are all part of DCU’s Strategic Plan for 2017-2022, which has contributed to making it the fastest growing university in the country. As of 2017, the university had 17,000 students. Ultimately, the plan aims to see the student population grow towards 20,000. This expansion has been aided considerably by the 2016 initiative to turn DCU into a five campus university and its takeover of the northside of Dublin seems like a natural progression. While bigger is usually perceived to be better, many students choose this university over others because of its smaller size and welcoming community. However, we are currently scattered all over and have the same number of students as Trinity College. Are we losing what makes us special or are these changes a welcome necessity that will only enhance the student experience? Sinead McCrohan, a Business Studies student, spent last year as a student ambassador. She is now spending her INTRA year working with a leading Irish science organisation that promotes STEM among Ireland’s youth. “It has allowed me to witness first-hand how important good facilities and equipment is to students striving for a career in STEM,” she explained. “The new DCU STEM centre will not only benefit the students that pass through it- allowing access to state of the art equipment which will help them in their studies- but it will also benefit DCU as a university; supporting the next generation of Ireland’s best and brightest in science, tech, engineering and maths,” she said. First year students will inevitably take the new student centre for granted, as in the majority of colleges across the country. For fourth years and postgraduates, it will be the bigger and better return of something they lost. Second and third years are the students most likely to truly appreciate the new building because they never had one before. DCU was only temporarily without a central social hub but it may come as a surprise that some universities have never had one at all. College life might have been slightly inconvenient lately, but living with no promise of anything would be far worse. “We have nothing! There’s a few seats in the SU but I’d still class us as severely lacking. People are usually on the couches in the arts block or making noise in the library, we have nowhere. It would definitely be useful for all students, especially the ones who commute for hours,” said Ailidh Phelan, a third year Social Sciences student at Maynooth University. that is significantly bigger is UCD. University College Dublin is the largest in the country in both population and size at nearly 34,000 students and 133 hectares. For comparison, DCU has nearly 40 hectares across all campuses. “The campus might seem daunting, but it just provides a large safe space for students, full of amenities for them to avail of. It can be a bit tight getting from one class to another on time sometimes but generally you stick to the same few buildings that are close to each other,” says Sophie Hevey, a 2nd year UCD Arts student and student ambassador. On the other hand, some students truly prefer a smaller campus and population. “I see the same people, such as student leaders, very often and we recognise each other as we pass each other. In a similar way, it’s easier to make friends with people from any year since its a smaller college. It’s also extremely easy to find where to go because it’s only one building which isn’t huge,” says Leah Murphy, a first year Business Studies student at NCI which has a population of 5,000. DCU’s primary mission is to focus on creativity and culture through a variety of courses, clubs, societies and other programmes. This ethos has been present even before it gained university status and has continued as it grows in multiple aspects. As long as this is not lost, every student that passes through its doors will feel important; no matter how many are attending the university or how many campuses it has.